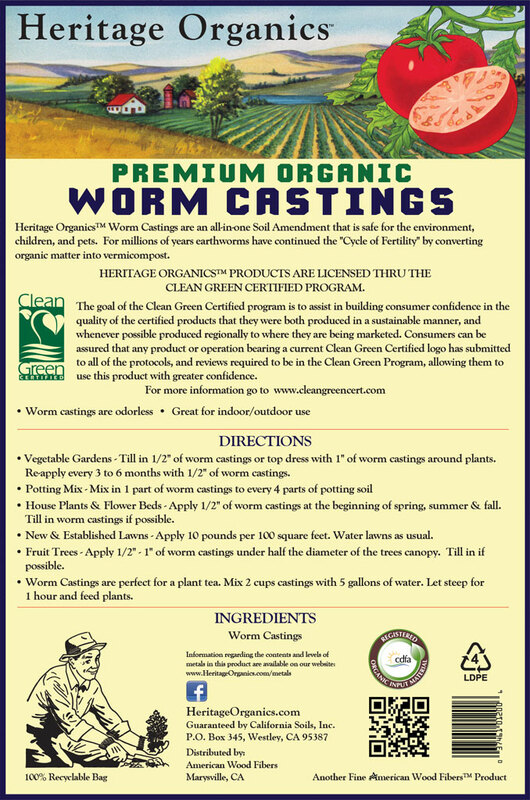 Heritage Organics® Premium Quality Organic Worm Castings are an all-in-one Soil Amendment that is safe for the environment, children and pets. For millions of years earthworms have continued the “Cycle of Fertility” by converting organic matter into vermicompost. Odorless. Great for indoor/outdoor use. • Vegetable Gardens – Till in 1/2″ of worm castings or top dress with 1″ of worm castings around plants. Re-apply every 3 to 6 month with 1/2″ of worm castings. • House Plants & Flower Beds – Apply 1/2″ of worm castings at the beginning of spring, summer & fall. Till in worm castings if possible. • New & Established Lawns – Apply 10 pounds per 100 square feet. Water lawns as usual. • Fruit Trees – Apply 1/2″ – 1″ of worm castings under half the diameter oft he trees canopy. Till in if possible. • Worm Castings are perfect for a plant tea. Mix 2 cups castings with 5 gallons of water. Let steep for 1 hour and feed plants.